John Worthy Chaplin was born on 23rd July 1841, the son of William James Chaplin, M.P. for Salisbury, and Elizabeth, nee Alston. He was educated at Harrow and entered the 67th Regiment on 13th April 1858. “John Worthy Chaplin, Ensign (now Lieut), 67th Regt (now of the 100th Regt). For distinguished gallantry at the North Taku Fort. This officer was carrying the Queen’s Colours of the Regiment, and first planted the Colours on the breach made by the storming party, assisted by Private Lane, and subsequently on the cavalier of the fort, which he was first to mount. In doing this he was severely wounded”. The action took place on 14th August 1860, and is second only to the famous Rorke’s Drift action for the number of Victoria Crosses awarded for action at any one time. 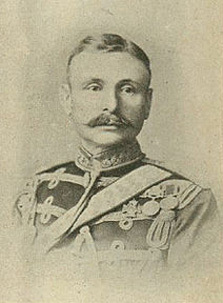 Of the seven Victoria Crosses awarded for the assault on the Taku Forts (China), five were won by the 67th Regiment. John Chaplin became a Captain in the 8th Hussars in 1864, and a Major in 1878. From 1868 to 1874 he was an extra aide-de-camp to the Lord-Lieutenant of Ireland. He married Isabel Thompson at Bishopsthorpe, Yorkshire, on 22nd August 1871. John Chaplin was promoted to Lieutenant-Colonel in 1879 and commanded the 8th Queen’s Royal Irish Hussars in the Afghanistan Campaign of 1879-1880, He 1883 he became a Colonel on half-pay, and in 1887 was created a Companion of the Order of the Bath. He retired in 1888, taking up residence at Kibworth Hall, where he lived for over 30 years. He died in Market Harborough on 19th August 1920. His Victoria Cross was presented to the Hampshire Regiment on 19th March 1964 by his grandson, and is kept in the Regimental Museum at Winchester. John Chaplin was the founder and first President of Kibworth Golf Club in 1904/05. He is commemorated by the ‘Chaplin Room’ in the club-house in Weir Road, which houses the print, right, depicting Ensign Chaplin engaged in the action for which he later received his Victoria Cross. He is buried in Kibworth cemetery, his grave marked by the largest memorial in the cemetery. Colonel John Worthy Chaplin C.B., V.C.